The name comes from the fact that this is a 100% Nicaraguan Puro. Makes sense. The number 1685 refers to the year that the city of Esteli was founded. As you all know, Esteli is the “Oz” of Nicaragua. The Alec Bradley Nica Puro is a new core line that has been released by Alec Bradley in 2013. This has been a much anticipated release by Alec Bradley Cigars. First up, this marks the company’s first Nicaraguan Puro (all Nicaraguan tobacco) cigar to be released. Secondly, cigar enthusiasts have been waiting quite some time for this show. The cigar was announced a year ago at the 2012 IPCPR Trade Show in Orlando, Florida. While the Nica Puro was targeted for a late 2012 release, a decision was made to delay the release into 2013. The Nica Puro has now hit retailer shelves, and this appears to be a cigar that has been well worth the wait. I recently have had an opportunity to smoke this cigar, and this is an impressive cigar that truly brings out some of the best of what Nicaraguan tobacco has to offer. 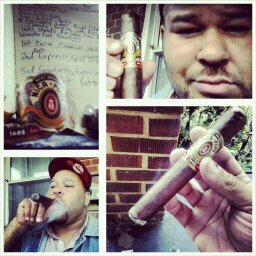 Appearance: The first thing most people notice about the Alec Bradley Nica Puro is most definitely the band. It is an eye-catcher for sure, full of lively, bright colors that create a beautiful design over the cigar. There are 2 bands on the stick, the top band states Nica Puro and Alec Bradley while the sub-band has the number 1685 scrawled on it, the year Esteli, Nicaragua was founded. The cigar itself is a rich, dark brown color with a slightly reddish hue to it, oily and a little rough to the touch. There is some small veining throughout the wrapper but nothing major that looks like it will interfere with the cigar. There is also a slight tooth to the cigar though not as much as I have seen on some other Nicaraguan wrappers.The presentation of this stick is beautiful I must say. Pre-Light Aroma: The Alec Bradley Nica Puro provides a wonderful bouquet of scents, highlighted by sweet notes of raisin, apricot and earthy undertones. The wrapper is where the earthy notes are much more pronounced, taking over your sense of smell and creating a delightful combo with the sweetness of the foot. Once clipped, the draw is effortless, bringing a load of flavor to the palate. The biggest flavor from the draw is a sweet plum with a red pepper like spice at the back of the tongue. The flavors from the pre-lit tobacco are inviting and enjoyable so let’s light this beauty up. The Alec Bradley Nica Puro starts off at the medium-full point right off the bat with big flavors of sweet earth with a nice peppery spice both on the back of the tongue and through the nose. Each puff leaves a lingering sweetness on the tongue that keeps you coming back for more. The ash is solid and a stark white color while the burn line is a bit wavy but nothing out of control and nothing that needs a touch up. The amount of smoke on each draw is phenomenal, providing a mouthful of dark, rich flavor from the thick cloud. The draw has remained open and easy through the first third without any issues.